The LIGHT Process is a way to move fearlessly and effectively through major transitions so that at the end of the day we have made progress—in our own lives and in the lives of those whom we desire to help. Things are different these days. Suddenly, what worked in the past is obsolete. We’re not sure what’s next. And most of us try to escape this painful feeling too quickly. Running faster isn’t the solution. We need a way to navigate change’s rough terrain without rushing off a cliff. To mine its creative opportunities. To thrive in its midst. The LIGHT Process leads the way through change. Five powerful questions provide the road map. Stories, poems, reflections, and affirmations support the journey. Whether change has found you or you are pursuing it, now you can deal with turbulent events one step at a time. By its nature, change is disruptive. But with this innovative method, you can move confidently through any of life’s transitions—great or small. The LIGHT Process untangles change’s confusion. 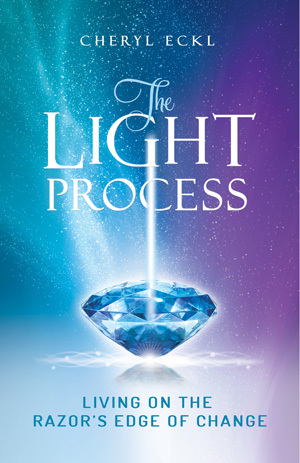 Deeply insightful and profoundly practical, The LIGHT Process can be adapted to any type of change—personal or professional. And for crises that demand immediate attention, a Start Here Guide is included. The LIGHT Process engages your inner guidance as you find meaning, peace of mind, and a way to help others. We are thrown into the Unknown—a sea of confusion and lost identity. We are no longer who we were, but not yet who we will eventually become. Our familiar moorings have sunk below the waves of uncertainty. We feel rudderless and overwhelmed by the absence of key internal and external landmarks by which we have previously navigated our way through life. This “Middle of Nowhere” is made increasingly painful as we struggle against the currents, trying to get through rough waters as quickly as possible. The problem is that when we rush from where we were to anywhere other than where we are now, we miss the opportunity for insight, creative discovery, and personal development that lie hidden in the depths of change. The LIGHT Process is a way to objectify change. Often we feel like victims of dramatic events. A force has acted upon us, rendering us at least temporarily stunned and potentially stuck with a sense of victimhood. In this state we are the objects of change, the unwitting passengers on a rocky voyage we do not recall signing up for. Even planned or welcome change can throw us into a maelstrom because these shifts often take on a life of their own, overwhelming us with their intensity or unintended consequences. We need a method for transforming overwhelm. For turning emotional reactions into practical actions that allow us to work with the energy of volatility, rather than against it. We need a way to stand apart from our troubling experiences, to observe the dynamics of change, and to choose when and how to engage them. The LIGHT Process is such a method. By applying its five questions to life’s fluctuations, we ourselves are transformed from lost buoys bobbing aimlessly on a sea of chaos to seasoned mariners who understand the deep currents of change. No longer in danger of drowning, we can view change objectively as a beneficent life force with which to navigate whatever is arising from the point of a fluid present. As we objectively engage change, the “Middle of Nowhere” is likewise transformed into the “Beautiful Middle of Now Here”—the essence of which can be seen as the tip of a oar as it slices into the water, moving the boat of Self forward to a more illuminated shore. The LIGHT Process teaches us how to live there. I have great respect for this author–not only for her writing style, which is superb, but for her wisdom and ability to convey the essence of what life’s bumps, confusions and grief are about, and why it is so important to make human existence into a transforming journey. I find Eckl’s questions and philosophy grounding; her case examples are pertinent and inspiring. She capably helps the reader understand how relevant life-shaking change is, how the light process can enable the sufferer to endure and possibly become stronger, no matter how difficult or confusing that may seem at the moment. The story of the author’s father, Dennis, was a particularly good example of how integrity can survive a mortal’s lifetime to enrich/encourage others. I liked Eckl’s poems; when I read how she has worked in musical theater, it became clearer to me why this entire self-help book, while philosophical, has the feeling of having been written by an artist. It is exceedingly eloquent. I very much appreciated finding end notes as they are the sign of a person who values study and reference. What Is The LIGHT Process—Q&A?